THERE’S a cool elegance, complexity and delicacy of touch to tenor saxophonist Delecca’s second quartet album, but one track stands out. On Regulated, Delecca and Marc Hannaford on piano build excitement through barely suppressed tension, ably backed by Daniel Farrugia on drums and Jonathan Zion on acoustic bass. It’s gripping, draining and satisfying. The all-new quartet, plus Elvis Aljus on congas in the energetic Catalyst, plays eight Delecca compositions and one, Blues Bungle, by pianist Will Poskitt, to whose memory the album is dedicated. This contained outing offers melodic beauty (A Dog’s Tale, Lost City) and sustained intensity (Catalyst, Living With Weirdness). 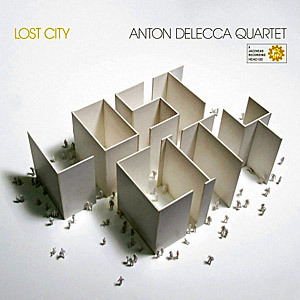 This entry was posted in CD REVIEWS and tagged Anton Delecca, Anton Delecca Quartet, Daniel Farrugia, Elvis Aljus, Joe Henderson, Jonathan Zion, Lost City, Marc Hannaford, Steve Grossman, Will Poskitt. Bookmark the permalink.